So as of late, I've been putting in two hours at the gym and watching two episodes of Netflix's amazing show House of Cards from the second season while I'm on the treadmill and the elliptical. Having that carrot makes having to do the runs more tolerable. Don't get me wrong, I'm glad I've lost close to 70 pounds, but hell, ain't nobody happy to be on a treadmill. And frankly I don't understand you people who like running for fun anyway, even when you've got wonderful scenery to look at. House of Cards has a lot of great things going for it - crisp writing, gorgeous cinematography and an amazing cast. And the heart of that cast is the always great Kevin Spacey. Lots of people are familiar with some of Spacey's giant successes such as The Usual Suspects, Seven, American Beauty and L.A. Confidential, but there are a couple of films of his that never really got noticed like they should've been. The one I want to talk about today is The Big Kahuna. Don't feel bad if you didn't hear about it. The film didn't get much press, and it didn't get a very wide distribution, so it slipped under the radar from, well, almost everyone. And it's a damn shame that it did, because it's sort of an actor's showcase. Let's start by telling you the cast - Kevin Spacey, Danny DeVito and Peter Facinelli. And that's it. I think maybe there's a bellboy who gets a single line or something, but other than that, these are the only three actors who speak in the film. And they talk a lot. See, The Big Kahuna started its life as a play, called Hospitality Suite. And the film is a faithful adaptation of it, as the film is mostly set in the one room in question, with the three men talking about a lot of things, but mostly how they're going to try and get one particular account. Spacey and DeVito play two marketing guys and Facinelli is a member of R&D who's come along with them. The framework on which everything hangs is that Facinelli's character bumps into the man whose account they're trying to get and invites him to a party, but just him, leaving Spacey and DeVito, the marketing guys, out in the cold, hoping that their R&D person can convince him to talk to the marketing guys. Instead of talking to the titular Big Kahuna about their product, Facinelli's character decides to talk to him about religion, which incites quite a reaction from Spacey/DeVito. Spacey plays the loud mouthed, high strung cynic, DeVito plays the world-weary everyman and Facinelli is a little too earnest for his own good. This is a film that hangs on the performances of the three men involved and it reminds me how underappreciated Danny DeVito has been over his career. 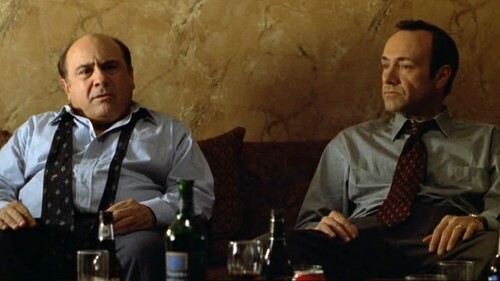 I mean, people like DeVito but you don't often people talk about what an amazing actor he is, I suppose because he doesn't always have the greatest sense of what films to take and what to pass on, but this is one of the films that should convert anyone who doubts the man is a hell of an actor. It's easy to see why Spacey was drawn to this script, because it's a livewire performance that plays to his strength - aggressive, confident and a little brutish, all of the things that make him great in House of Cards. But DeVito is the center of this picture, and the other two actors pivot on him, as he's sort of the middle ground between Facinelli's wide-eyed innocence and Spacey's hard cut bitterness. And Facinelli has the hardest part in this show, as he's clearly out of his depth. There's a wonderful exchange early on where Facinelli says "Throw me in the water and see if I can swim," to which Spacey responds, "I think you're missing the point here, Bob. We're about to throw you off a cliff and see if you can fly." The film is part comedy, part soul searching and part meeting of the minds. 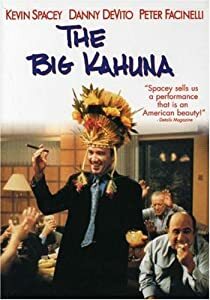 It's not for everyone, but it's definitely a film that should be seen, and if you've devoured the second season of House of Cards and are looking for other ways to get your Spacey fix on, Big Kahuna will do you just fine.